As of today, it's been ten years since I started this blogging journey. I didn't quite know what I wanted to do with this platform, and to be honest, I still don't. It's a great medium to get my words and pictures out there. I went back and took a look at my most popular posts, both by most views and most comments. There were a few intersections of the two. I thought about sharing some of those links with you but realized that no one is likely interested in all that. Truth be told, most of them were blog hops of some sort, with a few thrift store scores and other miscellanea mixed in. I discovered a few posts and link-up series I had forgotten about and realize that there seem to be fewer and fewer of those out there in the blogoverse. I could ponder and ramble on about blogging for ages, but let's get to the giveaway portion instead. 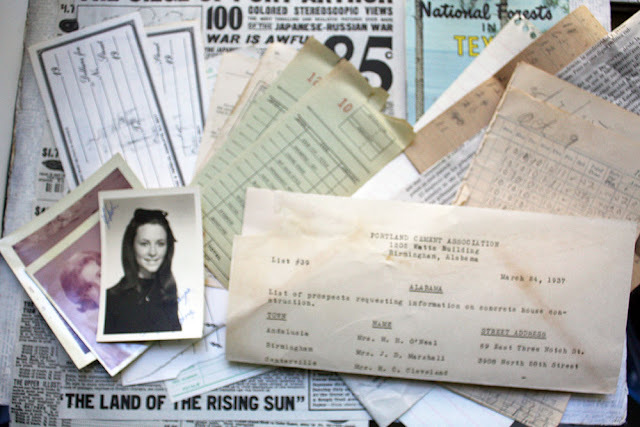 I decided to simply gather a little bit of everything: some jewelry, jewelry-making supplies, ephemera and collage materials, altered elements, and so much more. Here's a better look at what will be included. I started by picking out a few pieces of completed jewelry. 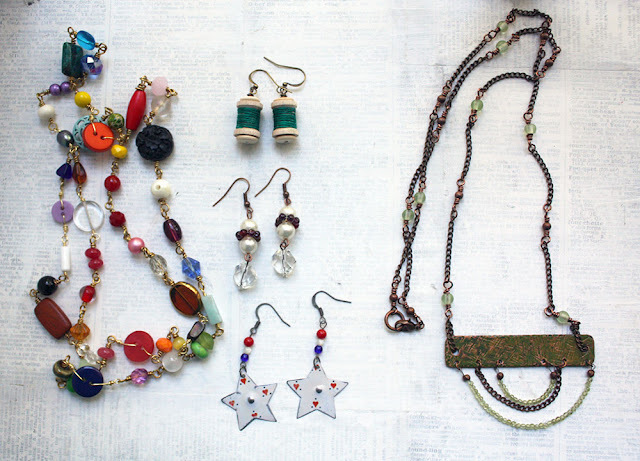 There's a long necklace of mixed beads and buttons in a rainbow pattern, three pairs of earrings from #The100DayProject, and a copper and peridot necklace. Next, I sorted out salvaged jewelry odds and ends that you might be able to work into your own jewelry designs or mixed media projects. 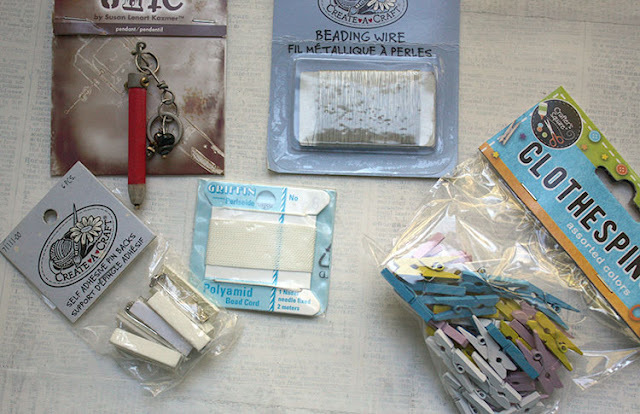 Here are a few items still in their packaging: a pendant from Industrial Chic, beading wire and cord, pin backs, and some little clothespins. 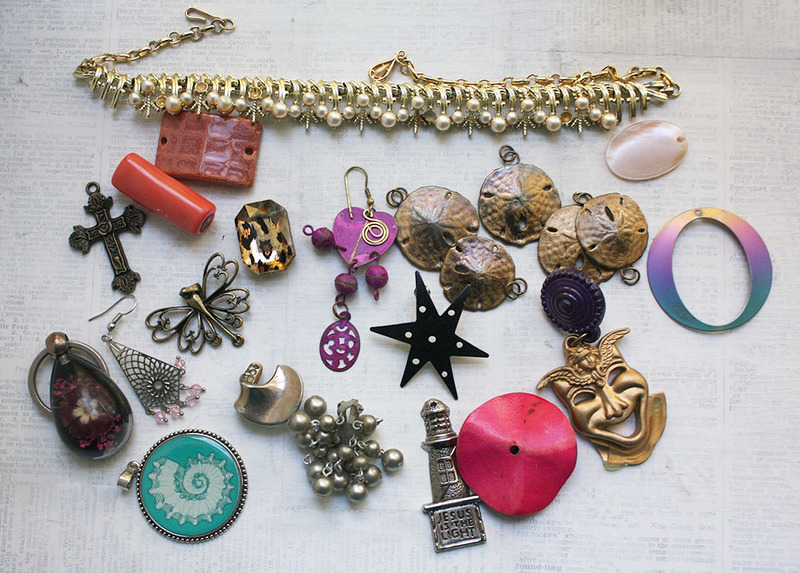 I've got quite a collection of items I've altered somehow for jewelry designs. 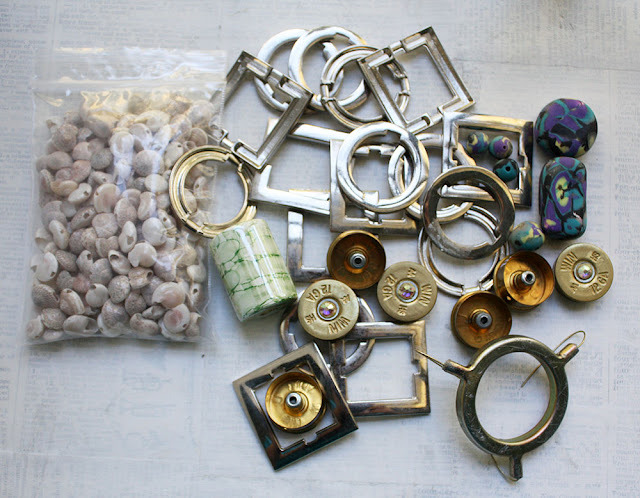 There's a bit of de-stash that includes a baggie of shells with holes for stringing, sections of a metal belt I took apart, a large ceramic bead, polymer clay beads, and a few other odds and ends. For fun, I gathered a few paper goodies. Here are a several of my gelli-printed papers and a couple of die cuts. 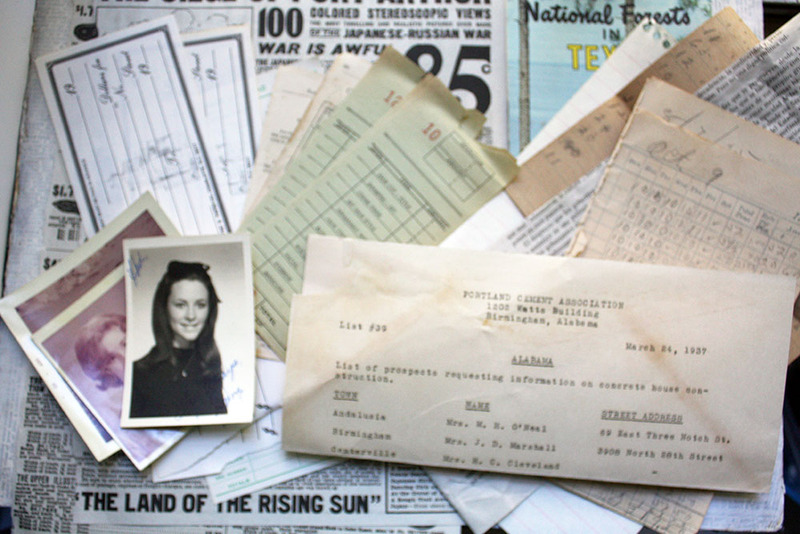 In addition, a stack of ephemera and other collage materials came together. I went to my little junk drawers for these beauties. 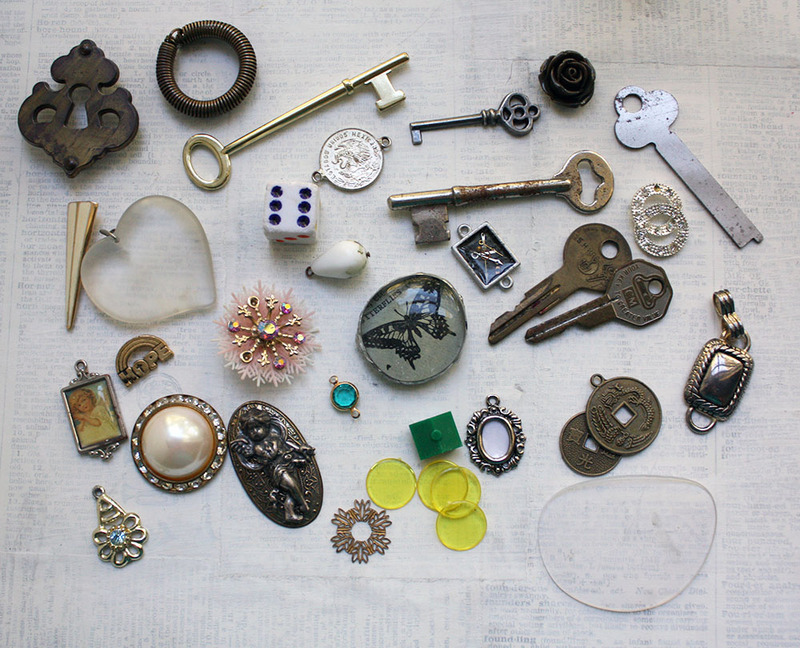 There are game pieces, keys, a keyhole, salvaged charms, an eyeglass lens, and other found treasures. No giveaway from me would be complete without a few buttons. There are mother-of-pearl ones as well as a selection of other buttons. For the last little touch, I tossed in some cut tin. These have already been filed and sanded so the edges are butter-smooth. There's a possibility that more goodies might be added. I haven't even touched the beads yet! The contest will end on Thursday, November 9, 2017, and winner will be announced on November 10th. I think that's everything, except...THANK YOU to those of you who come back here time and again to see what's going on in my little corner of the internet. I appreciate your interest, support, encouragement, kindness, and friendship more than you know. It means the world. Thank you. Wowzers! 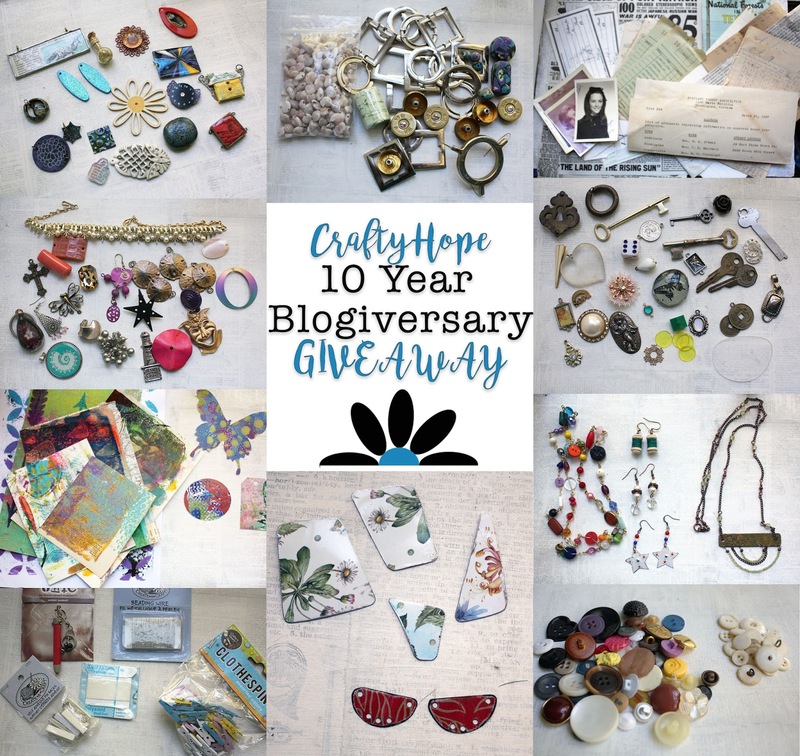 Ten years of bloggy and crafty goodness!! !i don't always comment when I come by, but I do like a little peek into your world!!! Favorite thing? Hope created gelli prints! Congratulations, Hope. I don't comment much, but I do read and follow your blog. You have a very creative mind! Thanks Candy! I appreciate that so much! This is the most exciting giveaway I’ve ever entered. I usually don’t enter them but too cool not too. Congratulations! 10 years is amazing! First, I want to thank you for creating this blog. I have learned so much from your world and other blogs like this. I don't always tell you so, but I love each and every new entry you make! 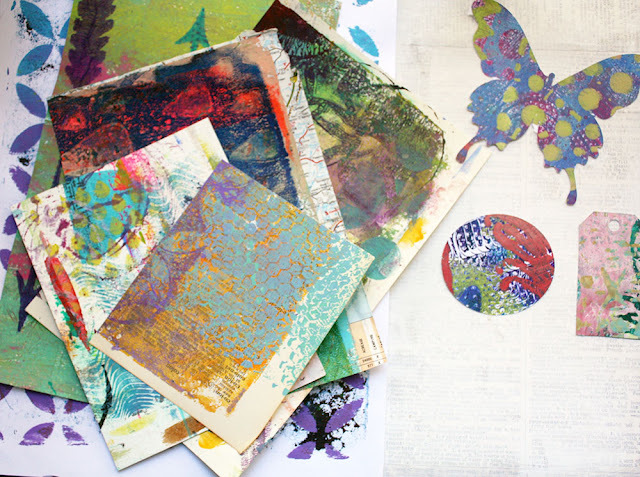 So hard to choose a favorite, but I love bits and pieces and the gelli prints are gorgeous! You have created a very generous giveaway, I can't think of anything you left out! Wow 10 years...you have done a great job. I love, love, love, all the crafty goodies...my favorite is the tin....I have become a hoarder of tin cans...lol, my husband hates it. As for what's missing...I think you have it covered...but maybe some chain? 10 years, what a great milestone! Congratulations!!! My fav item would be the button and bead rainbow necklace. It looks so cheerful and fun. What to add? Well, I think you have plenty in there and depending on how many comments you receive you might want to think about splitting the pie in two so there are a couple of happy campers out there. I wish you 10 more wonderful, inspiring years of blogging! Liz, Thank you!! I'm so pleased you like that rainbow necklace. I'm a sucker for anything in a Roy G Biv pattern too. I appreciate your best wishes. I do need your e-mail though (you can message me separate if you want at CraftyHope at gmail dot com) Thanks again! Happy blogoversary! I discovered your creativity here, and now enjoy your creations on IG. I had to take another look as you seemed to have included everything. I guess stringing material is what I would add. Though I think your creativity kit is extremely generous as it is. Oh and my favorites are the keyhole and the smallest skeleton key from the junk drawer photo. I LOVE everything in the junk drawer and button photos. I’m sending you my email instead of posting it in the comments. Hope that still counts. Congrats again on sharing your creations with the world for a decade. Thanks so much! The keys and buttons are my favorites too. I almost just posted a picture of the junk drawer stuff on IG (and may still) to promote the giveaway. And yes, as long as I get your e-mail somehow, that's fine. I just want a way to contact the winner. Thanks so much for all the kind words. 10 years??? I had no idea! Your giveaway is so generous Hope, but don't enter me as I would be likely to give it back to you 🤣 Congrats for continuing! Thanks so much for the opportunity to join the giveaway, and for all the lovely things that you share! Congrats on 10 years! Please count me out on giveaway. I have way too much stuff although I would love those tins. I didn't realize it had been 10 yrs. But you have been crafting long before that. I remember when you wee just trying to figure how to figure out this blog thing. You are an amazing artist that can see potential in found pieces. That is the part I love, to see what you come up with. I like the copper and peridot necklace, and the sand dollars and a few other things in the salvage jewelry. 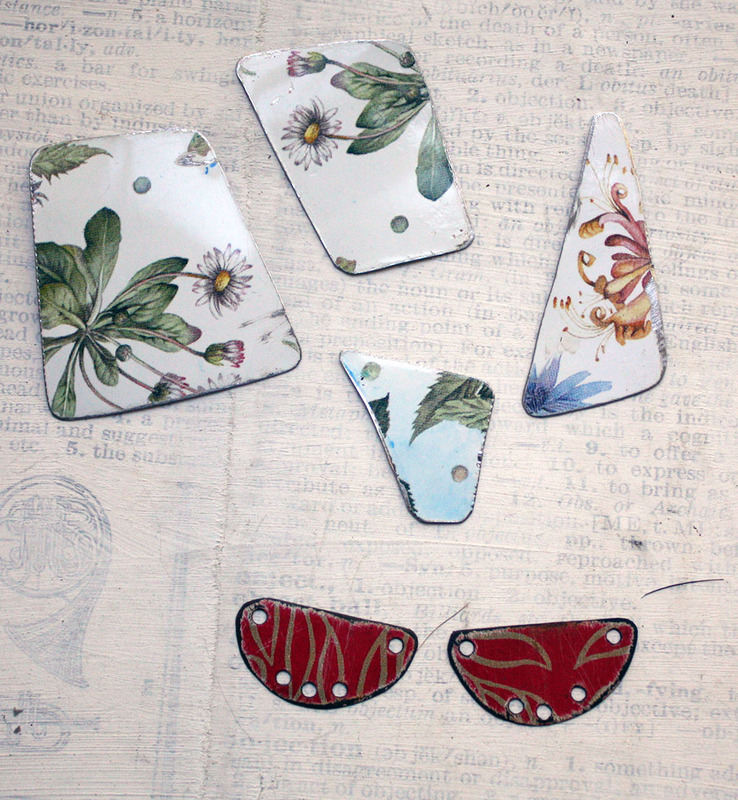 barbarawilson2@aol.comThe Cut tin pieces are good too. 10 years? No way! That's just nuts! I guess I shouldn't be so surprised since kid growth should be helping me keep track of the passage of time. Congratulations! 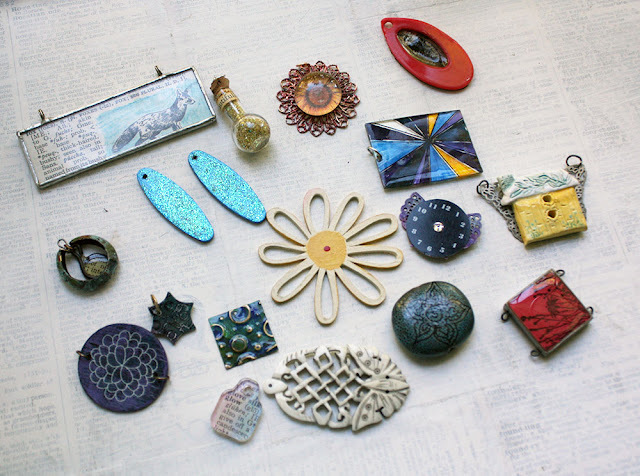 I love your altered stuff pile, the cut tin, and always love crazy keys. Plus, you've got a necklace with peridot beads, so I dig that too! But, alas, I'm not able to put much time into creative endeavors other than costuming, so please leave me out of the giveaway. On a completely different topic: I can't believe how long it has been since I've seen you...in football season no less!! Pezz, Yup! So glad you see some items that you think are cool. They're always available to you. And YES. I was just thinking today that it's been WAY TOO LONG since we hung out. Pat being sick has kept up confined to the house for the most part. It's been a pretty dragging month. Gah! Hi - Don't enter me in the giveaway; it should go to someone who has been following your blog for a while. Even though I follow you on other social media and enjoy your work, somehow I haven't followed you blog until just recently (so I would have been interested in those links! But I will explore on my own). I wanted to say Happy Blogiversary. Happy Blog Anniversary! Wow 10 years! That's amazing! I'm so happy for you. I love it all! You have a way to make anything look beautiful. Amanda Faye, Thanks baby girl! As for the craft session, you know all you need is to let me know if you need that! Miss you bunches! I am signing up for a Wine with Crafty Hope session at the beginning of 2018. That will include me coming to your house with my over night bag for a slumber party! I love you too very very very much! Come on! You know where I live. How fun! Congrats! The butterfly is pretty interesting, but my favorite by far is the fun paper receipts and things you've included. I think the only thing missing is a map or something with very interesting older looking hand writing. I've commented from my gmail login amyhincrw.